Once upon a time around 15 years ago it was impossible to go to any Christian youth event without seeing a swathe of bracelets marked with ‘WWJD?’. ‘What Would Jesus Do?’ was the fashionable question. These days they’re less common, but sometimes I still catch myself thinking it through. What would Jesus want me to do for those people I know who are going to be on their own this Christmas? WWJD? is a very sensible question to ask in the appropriate context, but in the wrong one it can be rendered meaningless to the point of nonsense. YouGov carried out a survey last week which was in danger of falling into the latter camp. How is anyone supposed to answer “Do you think Jesus would support or oppose renationalising the railways, so they are run in the public sector rather than by private companies?”? Unsurprisingly the majority of respondents hadn’t a clue. It wasn’t really a burning issue in first-century Palestine. The issue of dealing with foreigners was, however, so asking, “Thinking about immigration into Britain, which of the following do you think would be Jesus’s view?” was a much more sensible question. Once again, the most popular answer was “Don’t know”. Interestingly, after that the most common reply by far was “Jesus would want no restrictions at all on the amount of immigration into Britain”. This was even the case for Ukip supporters. How many of these views were based on any form of biblical study rather than a hunch, though? This is often the problem when the public are asked about Jesus. Most would say that He was a good man and then, after that, imagine what He would do or say through the lens of their own interpretation of what it means to be good. Sometimes the result can be profound and revealing, but at others it can end up being quite bizarre. During an interview in the Independent a few weeks ago, atheist comedian Tim Minchin came out with the incomprehensible opinion that “If Jesus were here now he would clearly be a liberal humanist”. Occasionally assertions about Jesus become more disturbing and sinister. Church of England clergy may be banned from being members of the BNP, but that doesn’t stop it attempting to use Christianity as a weapon. It has a page on its website entitled ‘Jesus is Saviour’ and posted a very creepy fireside video of Nick Griffin retelling the Christmas story on YouTube in 2009. 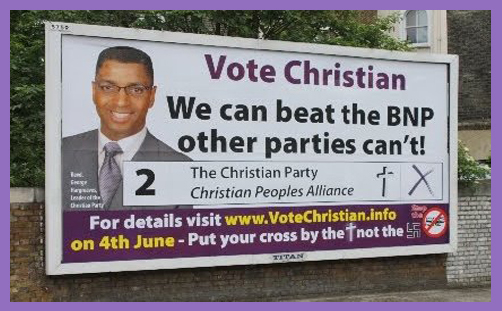 During the same year, in the run-up to the European elections, the BNP unveiled a billboard poster which featured an image of Jesus alongside a quote from John’s Gospel (15:20): “If they have persecuted me, they will also persecute you.” This was followed by “What Would Jesus Do?” and the answer: “Vote BNP”. It almost goes without saying that such a statement wouldn’t hold up to even the most superficial scrutiny. When political parties claim to be the true representatives of Christianity, or Jesus’ words are taken out of context in the public arena by those in power, great damage can be done. We’ve seen sectarian violence being carried out in the name of Christianity in Northern Ireland and there are plenty of other examples where religion has been taken and used as an excuse to justify horrific wars and crimes. Fortunately the BNP have been sufficiently incompetent and abhorrent in their views to have been firmly rejected by the majority, but that hasn’t stopped some of their twisted religious rhetoric from lingering on. The warped and selective views of Golding don’t deserve the attention that this piece has probably given them, but how many of us could argue against them if it was necessary? How much more does the average Christian know about the real Jesus compared to your average person on the street? It’s probably not as much as ought to be the case. We might not ever have to take on someone with far-right views, but what should we say about our multicultural society, British values, the role of faith schools, immigration, the rise of Islam or the benefits system? These are very real issues that can’t be dodged either, because they affect us directly or will need to be addressed at the ballot box in our decision on where to place our ‘X’. ‘What Would Jesus Do?’ bracelets might not be quite so fashionable these days, but the question is only going to grow in relevance over the coming years in a world where religious and secular tensions continue to increase. And, as this happens, both the Church and individual Christians need to be prepared to give an account and take on these challenges with words and actions that are full of God’s power, grace and wisdom. This article was first published at Christian Today on Monday 1st December.